The official page for the City of Fountain Valley, with news and information about City Council, business licenses, street repairs, special events and more. Enjoy a "Spring Freebie" a limited-time offer from your local eateries! 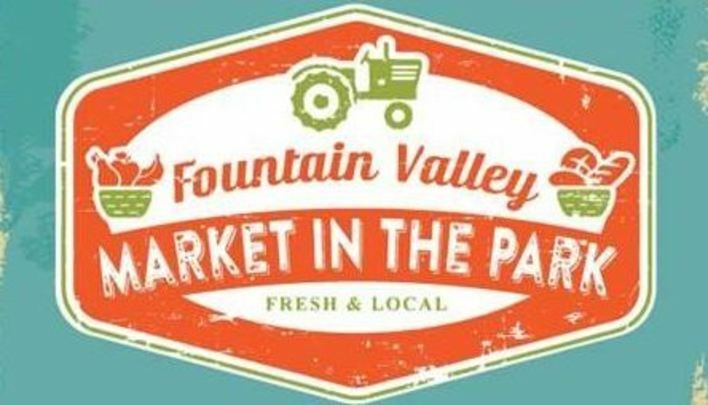 Experience FV partners with the Fountain Valley Restaurant Association to present Spring Free, an exclusive event taking place in the City of Fountain Valley on April 7th to Apri13th. Spring Free w ill showcase local eateries each with an exclusive “Get to Know us” freebie to share with locals. Spring Free is a great opportunity to discover, explore, and taste award-winning plates in your neighborhood. In addition to supporting amazing stories behind each outstanding plate. Celebrate LOCAL on this National Mom and Pop Business Owner Day! 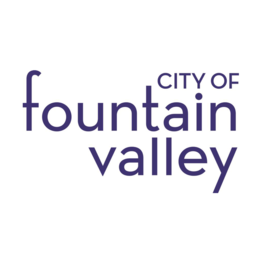 Join us at the Experience Fountain Valley Food & Wine on October 4, 2019. Food, Wine, Entertainment and more. Adults only. 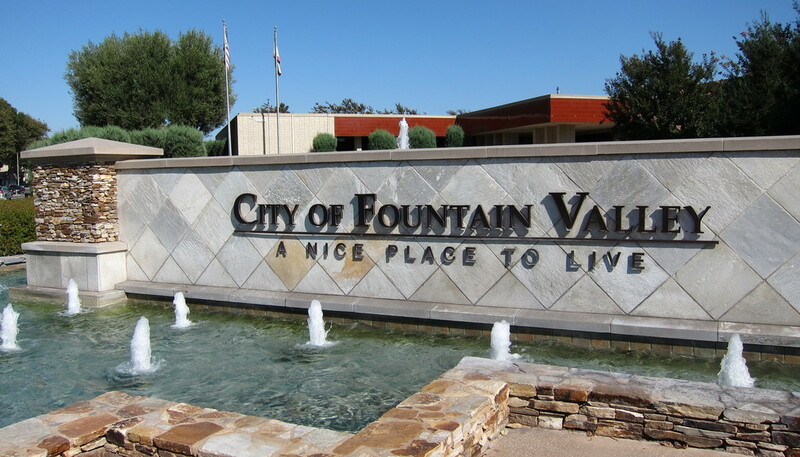 Come out and experience /discover what Fountain Valley has to offer. Don't m iss out in supporting FV Fire Department! Tickets are limited $45/person and $50/ person at the door. Join us at the Experience Fountain Valley Information and Resource Fair on January 30, 2019, from 8:30 am to 10 am. We will have guest speakers and resources that will assist you in your business ope rations. 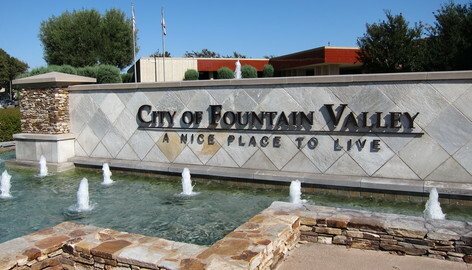 In addition to more information about the upcoming Experience Fountain Valley event on October 4, 2019. 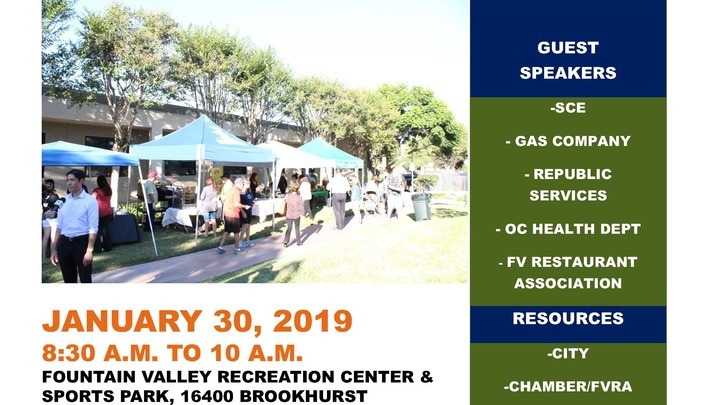 The resource fair will be hosted at the Recreation Center and Sports Park. 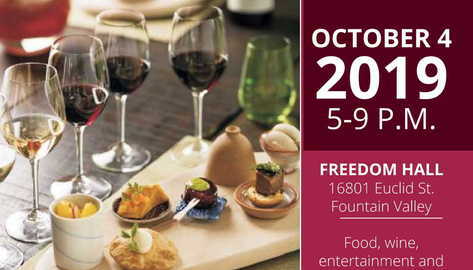 Experience Fountain Valley's Restaurant Week! We're kicking off the week right on October 4th, also known as Taste Day! A day where you get to sample a myriad of different foods from participating restaurants of Fountain Valley. We have newbies, we have oldies, we have food that spans the globe, and all is accessible upon making a $5 donation in return for a wristband! The wristband grants you free access to all of the foods graciously provided by the event's sponsoring restaurants, and every cent goes towards the Waste Not OC Coalition. Waste Not OC is a public-private coalition with the goal to end hunger in Orange County by facilitating the donation of wholesome surplus foods and allocating it to local pantries for those in need. This means the more people you bring to eat, the more people you'll help feed! 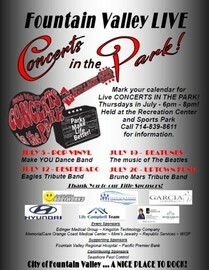 Concerts in the Park in July! 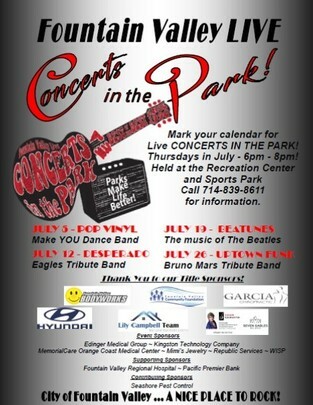 Are you ready for Concerts in the Park? We have an awesome line up for your entertainment in July. Bring your family, friends, and neighbors. Have a Safe Fourth of July - Leave the Fireworks to the Professionals! Fountain Valley Fire Department would like to remind everyone that fireworks are only legal in 10 Orange County cities. Fountain Valley DOES NOT allow fireworks. State-approved fireworks are allowed i n the cities of Anaheim, Buena Park, Costa Mesa, Fullerton, Garden Grove, Huntington Beach, Santa Ana, Stanton, Villa Park and Westminster. The National Fire Protection Association as well as the Fountain Valley Fire Department would like to encourage residents to leave fireworks to the professionals. 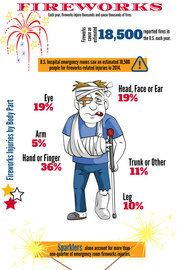 According to the National Fire Protection Association, thousands of people each year are injured using consumer fireworks. Sparklers are often thought to be harmless and given to children; however, sparklers burn at 1,200 degrees and can cause significant injuries. United States hospital emergency rooms treated an estimated 11,900 people for fireworks-related injuries in 2015. Of the reported injuries, 65% were burns. Additionally, on Independence Day in a typical year, fireworks account for 40% of all reported U.S. Fires. Fireworks start 18,500 fires, including 1,300 structure fires, 300 vehicle fires and 16,900 outside/other fires. These fires result in approximately $43 million in direct property damage. There are several public fireworks displays and parades scheduled around Orange County for you and your family to enjoy. You can find a list of celebrations at https://patch.com/california/orange-county/orange-county-july-4th-fireworks-parades-more-2018-guide. Once again, please leave the fireworks to the professionals and enjoy a safe and fire-free holiday. Closed alternating Friday. 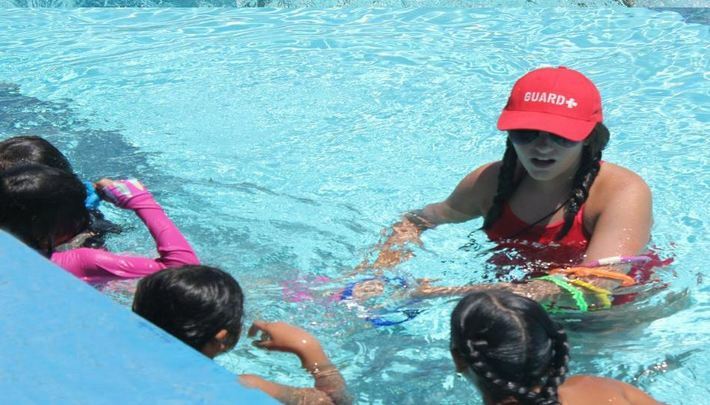 Please call (714) 593-4400 or see calendar, https://www.fountainvalley.org/calendar.aspx?view=list&year=2018&month=7&day=.